Cancer Commons is thrilled to report the public launch of Smart Patients, a new online discussion platform for cancer patients and their caregivers that will enable them to learn from each other and improve their care. The free website lets users share insights about personal treatment experiences, discuss breaking science, and search for clinical trials. Cancer Commons will be partnering with Smart Patients to bring patient insights to our Rapid Learning Communities. 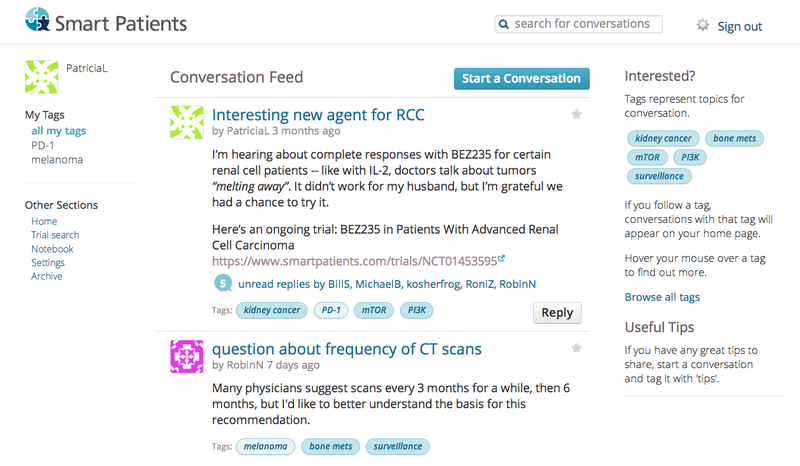 Cancer Commons’ research collaborators will be able to access anonymous insights from Smart Patients discussions. These insights will help Cancer Commons in its mission to make sure every cancer patient is treated according to what’s working best for similar patients. Zeiger’s cofounder, Gilles Frydman, is keenly aware of the fruitful exchanges already taking place among highly engaged cancer patients. He previously founded the world’s largest collection of online cancer discussion networks, the Association of Cancer Online Resources (ACOR). “With Smart Patients we hope to improve upon the work we have done with less flexible technology on ACOR. We are especially excited about the ability to support conversation across traditional disease boundaries, like when patients with different cancers are talking about the same drugs or molecular pathways,” Frydman says. The screenshot above is an example of what a registered Smart Patient might see when logging into the website. The patient is following conversations about “melanoma” and “PD-1,” as shown under “My Tags” on the left. Smart Patients displays all conversations related to those keywords; the user can then click on any conversation name to read previous exchanges and add personal insights and/or questions. To learn more go to www.smartpatients.com or watch this short demo video.